I scream, you scream, we all scream for ice cream don’t we? I know I do! Okay, I’ve blogged about tons of ice creams before, and yes, you may be beginning to think that I am totally hooked on ice cream. And, there's some truth in that... (and there will continue to be many ice cream posts to come!). Each ½ cup serving contains 130 calories and gives you a great deal of the traditional ice cream taste with just 4 grams of fat per serving (so 3 weight watchers points). 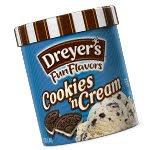 For an unbelievable low calorie milkshake, I’ve found that blending Almond Milk with ½ cup of Dryer’s Cookies-and-Cream ice cream creates a milkshake so rich and delicious, you’ll think it is much more fattening than it really is. Put all in blender and puree until smooth. Sit outside and savor as this is the perfect summer time treat! Holy hot cakes! I never knew they had a cookies & cream version. Why have a never seen it? My grocer must be lame. Wow this is great. and if you use Almond Breeze Unsweetened Vanilla milk it will only have 170 calories. You cant beat that!